Let’s pause for a moment to honor the remarkable fact that Pearlman and his orchestra are still at it, over a quarter-century later, delivering high level period-instrument performances while now introducing an entire new generation of listeners, and even performers, to this dynamic niche within the classical music world. 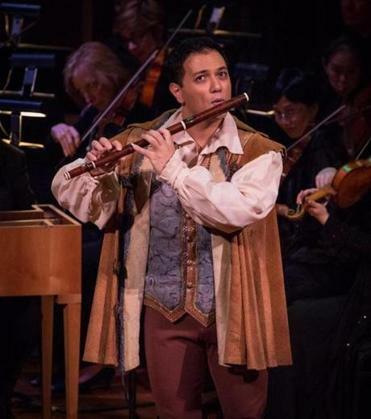 On Saturday night “The Magic Flute” was back at Jordan Hall under Pearlman’s direction, with the Boston Baroque orchestra still boasting veterans from its earliest years including oboist Marc Schachman and flutist Christopher Krueger, who reprised the very flute solos he had played at the 1989 performance. These musicians now sit on a stage with players who were almost certainly not alive when Pearlman and Banchetto got its start. The early music movement has of course grown enormously in the intervening years, but “The Magic Flute” remains a beloved staple of modern opera houses, so it is still a special occasion to hear a robust live account of this score using the older instruments Mozart would have recognized. On Saturday, the second of the weekend’s two performances, the ensemble under Pearlman played with a concise piquancy, grounded by its earthy strings and leavened by its intimately humane woodwind timbres. Matters of balance between singers and orchestra also tend to take care of themselves when period instruments are used. The plot of “The Magic Flute” leaves plenty of first-time viewers scratching their heads (“Never was so senselessly stupid a subject set to such captivating music,” Tchaikovsky wrote). For this occasion, Mark Streshinsky’s semi-staging did not ask you to sweat the details but rather mined this Singspiel for its populist roots and broad humor, with sight gags and theatrical touches seemingly aimed at breaking down the proverbial fourth wall. The singing was in the original German but the dialogue was rendered in a liberal English translation (by Jeremy Sams). Heading a capable cast was the eloquent tenor Nicholas Phan, here singing his first Tamino. He delivered a limpid and subtly inflected performance, even if the role of this fairy-tale prince seemed to play only minimally to Phan’s own distinctive strengths as an interpreter known for navigating the complex emotional terrain of the art song literature. Leah Partridge was a dignified and tonally generous Pamina, and Andrew Garland had the crowd in his hands as the bird-catcher Papageno, singing adroitly and delivering his spoken lines with a deadpan comic inflection that seemed at times to channel Owen Wilson. So Young Park was an excellent Queen of the Night, tossing off the iconic coloratura passages in a way that made them seem not like decorative vocal preening but like an extension of the queen’s own pitiless hauteur. Gustav Andreassen was a vocally resonant Sarastro, though with a less regal bearing than most. The Three Ladies — Sonja Dutoit Tengblad, Mara Bonde, and Emily Marvosh — sang with a blended glow at once lavish and impeccable. And the youthful Three Spirits — Voices Boston members Charlie Purdue, Dhruva Schlondorff, and Kevin Liao — made an impressive and ethereal trio, aiding the questing characters in their moments of need. Sarah Heaton (as a nimble Papagena), Stefan Reed, Dana Whiteside, and Owen McIntosh (as Monostatos) all rounded out the cast well. It was also encouraging to see Pearlman, all these years later, still reaching for fresh terrain in period instrument performance. This “Flute” employed a rare keyed glockenspiel, imported from England, with a sonority as “magical” as any you will hear.